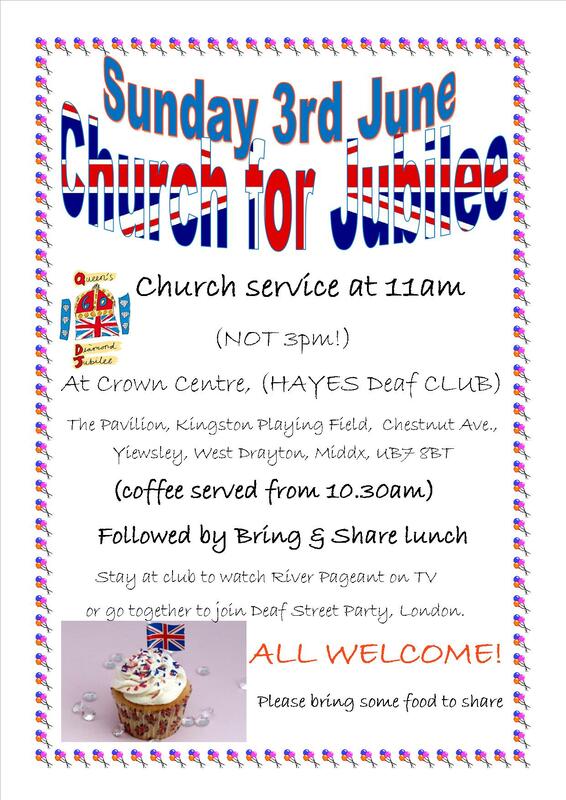 On Sunday 3rd June, the Deaf Church service at Hayes Deaf club, will be at 11am, not our usual time of 3pm. Coffee is available from 10.30am. This is because we will be celebrating the Jubilee! We invite all Deaf and signing people to come to share this special service. Afterwards, we will have a BRING & SHARE lunch. Please bring a plate of food to put on the buffet table. In the afternoon, you may stay at the club to watch the River Pageant together on the TV, or go out to the Deaf Street Party in London. We look forward to seeing you on 3rd June!